Description from GoodReads: This gorgeous follow-up to the Caldecott Honor–winning They All Saw a Cat explores another aspect of seeing the world for young children. Beginning with two cats, one black and one white, a chain of animals appears before the reader, linked together by at least one common trait. From simple colors and shapes to more complex and abstract associations, each unexpected encounter celebrates the magnificent diversity of our world—and ultimately paints a story of connection. Brendan Wenzel's joyous, rhythmic text and exuberant art encourage readers to delight in nature's infinite differences and to look for—and marvel at—its gorgeous similarities. It all starts with a simple "Hello." 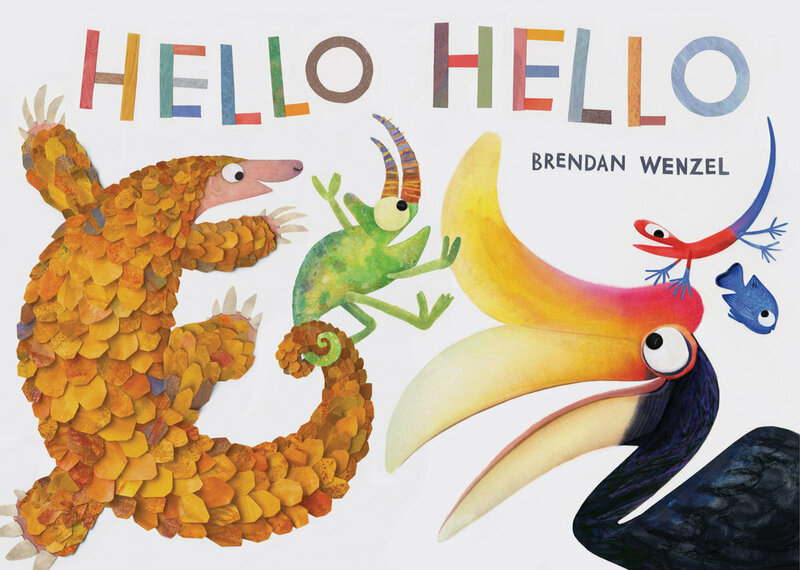 From the cover and through each page of the book, the bright colors jump off the white pages in a lively and celebratory style that makes readers want to read Hello Hello again and again. In addition to the bright colors and fabulous array of animals, the simple text expose young readers to simple contrasts such as spots and stripes and dots and size. This is one book that I definitely don't want to share my only copy so I will be picking up a couple of additional books for teachers. Look for a copy of Hello Hello at your local indie bookstore or community library. To further efforts to protect wildlife around the world, Publisher Chronicle Books has made a donation of $25,000 to the Wildlife Conservation Society in honor of the publication of Hello Hello. About the author/illustrator: Brendan Wenzel is an illustrator based in Brooklyn, NY. His work has appeared internationally in children’s books, animations and magazines. An ardent conservationist, he is a proud collaborator with many organizations working to ensure the future of wild places and threatened species, especially within Southeast Asia. Check out his website, here. The 5th annual #NF10for10 hosted by Mandy Robek and Cathy Mere is finally here. In 2010 Mandy Robek and I hosted our first picture book event. In 2013, Julie Balen suggested we add a nonfiction picture book event that worked the same. Participants choose 10 - well, usually 10 (they're a crafty bunch) - nonfiction picture books to share. On the day of the event, we'll ask that you visit the Google Community site to add your nonfiction link to the 2017 #nf10for10 tab. What: 10 nonfiction picture books you can't live without. Where: All posts will be linked on the 2017 #nf10for10 page of our Picture Book 10 for 10 Google Community Site. How: Stop by our community site, join the community, and share your favorites on February 10th. Originally, I had a different post planned for today. However, after Tuesday evening, when the Senate Majority Leader Mitch McConnell attempted to silence Senator Elizabeth Warren for wanting to read a letter from Corretta Scott King from 1986 regarding Senator Jeff Session, who was up for the Attorney General's position, I knew I had to change my post. McConnell's words had an opposite effect than he anticipated by becoming a new battlecry for women everywhere. In honor of women who #neverthelessshepersisted, I have selected ten of my favorite picture book biographies about women that I admire. I am thankful for their contributions to the their communities, countries and the world. They have shown us what it means to be women and to make a difference. Coretta Scott by Ntozake Shange; Illustrated by Kadir Nelson (Katherine Tegen Books, 2009) - I could not have a list without including a biography about Coretta Scott King given that it was her words that Senator Warren was trying to read on Tuesday night. You can read her letter here. Hillary Rodham Clinton: Some Girls Are Born to Lead by Michelle Markel; Illustrated by LeUyen Pham (Balzer & Bray, 2016) - Hillary will always be "my president" and I will continue to admire her and the work that she has done over the years and will continue to do. Rosa by Nikki Giovanni; Illustrated by Bryan Collier (Henry Holt & Co, 2005) - Rosa Parks did not likely realize that she would become one of the most well known faces of the Civil Rights Era but she continues to serve as a reminder and a model. Moses: When Harriet Tubman Led Her People to Freedom by Carole Boston Weatherford; Illustrated by Kadir Nelson (Hyperion, 2006) - With faith and conviction, Tubman worked to lead slaves out of the south by the Underground Railroad. Brave Girl: Clara and the Shirtwaist Makers' Strike of 1909 by Michelle Markel; Illustrated by Melissa Sweet (Balzer & Bray, 2013) - In a time, when there was little protection for any employees especially women, Clara Limlich organized a protest for better work conditions for women. She would have been leading the charge at the Women's March on January 21st if she were still alive. Who Says Women Can't Be Dotors? The Story of Elizabeth Blackwell by Tanya Lee Stone; Illustrated by Marjorie Priceman (Henry Holt & Co., 2013) - Despite discrimination and opposition against women becoming medical doctors, Blackwell persevered and paved the way for other women to become doctors. Solving the Puzzle Under the Sea: Marie Tharp Maps the Ocean Floor by Robert Burleigh; Illustrated by Raúl Colón (Simon & Schuster, 2016) - Marie Tharp faced significant prejudice as a woman in the field of science research. Also, it wasn't until years later that her contributions were truly acknowledge. For the Right to Learn: Malala Yousafzai's Story by Rebecca Langston-George; Illustrated by Janna Brock (Capstone Press, 2015) - Malala was just a teenager when she bravely took on the fight for the right to an education in a country where girls are commonly denied education. Wangari Maathai: The Woman Who Planted Millions of Trees by Franck Prévot; Illustrated by Aurélia Fronty (Charlesbridge, 2015) - Wangari Maathai won a Nobel Peace Prize for her work in changing the lives of women and in bringing peace and democracy to Africa through reforestation. Eleanor, Quiet No More by Doreen Rappaport; Illustrated by Gary Kelley (Disney-Hyperion, 2009) - Eleanor Roosevelt is another role model. Given the time period in which she lived she truly did amazing work as the First Lady of the United States. There are many more women and books that I could feature but here are some of my favorite strong, courageous, brave and influential women. "She was warned. She was given an explanation. Nevertheless, she persisted." The holidays are filled with the purchasing of gifts for family and friends. One of my favorite gift is a book and a beautifully illustrated picture book is not only a gift of a story but the gift of art. Bonus: I was trying not to include books that I had or would be putting on other lists but I just had to include a bonus book. Penguin Young Readers is celebrating the holiday season with 12 Days of Picture Books from 12/2 to 12/18. Today's picture book is The Day the Crayons Came Home. Check out Penguin Young Readers' Facebook page for the giveaway. For more gift ideas, check out Penguin's Gift Guide. I'm not sure what it is about this kid Duncan, but his crayons sure are a colorful bunch of characters! Having soothed the hurt feelings of one group who threatened to quit, Duncan now faces a whole new group of crayons asking to be rescued. From Maroon Crayon, who was lost beneath the sofa cushions and then broken in two after Dad sat on him; to poor Turquoise, whose head is now stuck to one of Duncan's stinky socks after they both ended up in the dryer together; to Pea Green, who knows darn well that no kid likes peas and who ran away—each and every crayon has a woeful tale to tell and a plea to be brought home to the crayon box. The crayons are back in more than one way. The creative team of Daywalt and Jeffers is also back with a companion book as good as the first. This time the crayons communicate in a series of postcards to Duncan. Through these messages, Duncan learns of these lost crayons that were forgotten and many times left in terrible condition. The neon red crayon has an adventure on his way back home and will capture your heart. However, it is the pea green crayon who changes his name to Esteban that I really liked. Fans of the Day the Crayons Quit will equally love the Day the Crayons Came Home. Pick up a copy at your local indie bookstore as a gift for your favorite young reader.